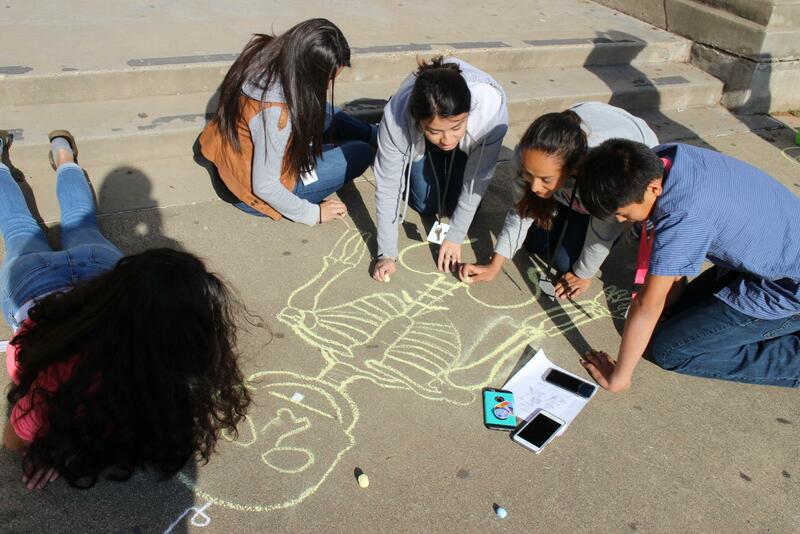 The Principles of Health Science students draw skeleton on the front pavement of the school. The Principles of Health Science class has taken some time to draw the anatomy of a skeleton in order to learn the placement and names of the bones. The drawings will be judged by Associate Principal Stephanie Richard. “I was having fun drawing the skeletons but also learning what the bones are named and placed,” freshman Alexis Anderson said. The students preferred doing notes but also hands on activities. The activities helped a lot of students to learn easier. Many students plan on going to the medical field so the Principles of Health Science classes provide the necessary closure for the students. “I plan on going to the medical field because I want to be either a veterinarian to help the animals in need or a nurse to help people get better,” sophomore Jocelyn Murillo said. The class had a great time drawing the skeletons and learning the bones in the body while being judged by Richard. The winners for the contest drawing were freshmen Brook-Lynn Henderson, Sarah Kosel and Zoe Craven. ”I felt really excited because we worked really hard and put so much effort into our work,” Henderson said.